Due to the ever-increasing requirement for higher speed transmission, 40G Ethernet is introduced to networking world, and it will gradually dominates the market. Many vendors have released different kinds of devices to support 40GbE, among which 40G QSFP+ module is the most popular and available for short distance or long distance data transmission. There are two variants short distance QSFP+ modules: QSFP-40G-SR4, and QSFP-40G-UNIV, what are the differences among these two types? This passage will tell you and give more information. Commonly, for QSFP+ modules, there are mainly two connector interfaces: MPO/MTP and duplex LC(Note: LC interfaced QSFP+ uses serial transmission, while MPO/MTP interfaced QSFP+ uses parallel transmission. In serial transmission, bits are sent simultaneously on different channels within the same cable, and in parallel transmission, bits are sent sequentially on the same channel). QSFP-40G-SR4 uses MPO/MTP to achieve data transmission over multimode fiber. However, in order to avoid wasting cost and deployment time when installing in different cabling structure, duplex LC interfaced QSFP-40G-UNIV is designed to be used in both single-mode and multimode links without adding any hardware or software. For MPO/MTP interfaced 40GBase-SR4, it offers 4 independent full-duplex transmit and receive channels, each capable of running up to 10G data rates per channel, achieving the total 40G data rates. These modules are often used with 12-fiber MTP trunk cable, four transmitting and four receiving, leaving the middle four unused. 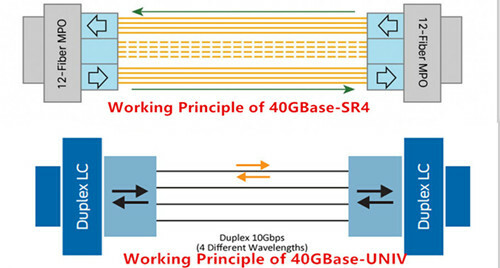 For duplex LC interfaced 40GBase-UNIV, it also uses four transmitters and four receivers but has built in optical multiplexing and de-multiplexing, which results in a duplex connector and hence operates over the same duplex fiber infrastructure as 10GBASE-SR.
40GBase-SR4 module can support link lengths of 100 meters and 150 meters, respectively, on laser-optimized mutimode fibers, and it can also be used in a 4x10G mode interoperability with 10GBase-SR interfaces up to 100 and 150 meters on OM3 and OM4 fibers, respectively. 40GBase-UNIV can support the same transmission distance over OM3 and OM4 fibers, but it can also achieve link lengths of up to 500 meters over single-mode fiber. 40GBase-UNIV is much more expensive than 40GBase-SR4. Take FS.COM for example, 40GBase-UNIV is $340, while 40GBase-SR4 is $55. Besides the price of the unit itself, we should also take the whole deployment cost consumption into consideration. Migrating from 10G to 40G is inevitable. The existing 10G network uses two fibers for dual transmission. But most 40G network uses 12-fiber MTP based fiber optic cable for dual-way transmission over multimode fibers, which means if we use 40GBase-SR4 with MTP port for 10G to 40G migration, more optical fibers will be added and the cabling infrastructure will be changed. However, with 40GBase-UNIV module, it can support the same or longer transmission distance as the 40GBase-SR4 does, but it uses two strands of dual-way transmission like most 10G network, which will keep the existing 10G network when upgrade to 40G, greatly saving cost and time. We have introduced QSFP-40G-SR4 and QSFP-40G-UNIV modules for short distances transmission. These two module types have different features. Choosing which one totally depends on your practical applications and budgets. FS.COM has plenty of QSFP-40G-SR4 and QSFP-40G-UNIV optics in stock. For more information, please check FS.COM.